Nearly three years after the EU net neutrality regulations came into effect, neither service providers nor national regulators have been role models in following the rules, a new report concluded. The Vienna-based non-profit organisation Epicenter.works recently published a report to present its multi-year research into how the EU’s net neutrality regulation has been implemented. The report, titled “The Net Neutrality Situation in the EU: Evaluation of the First Two Years of Enforcement”, examined how the regulation was interpreted differently by the regulators and how the service providers have taken it into their own hands to decide what to implement, or not implement in the 28 EU member states as well as the three EEA nations ((Norway, Iceland and Liechtenstein). The results were not the most encouraging reading. The EU regulation on net neutrality came into effect on 30 April 2016. The Body of European Regulators for Electronic Communication (BEREC) was mandated to lay down guidelines on the implementation for the national regulators. However, unlike other laws like GDPR, the net neutrality rules give member states the authority to decide the level of penalties if the rules are broken. “This has lead (sic.) to a situation where some member states have not laid down rules for violations of net neutrality protections two years after the regulation entered into force,” the report says. The area that the most offences were committed was differential pricing practices, in particular zero-rating data for selected applications and services. Although only Bulgaria and Germany have excluded “illegal commercial practices” (price discrimination when providing access to specific applications and services, in this case, zero-rating certain apps or services) from their penalty provisions, a total of 186 differential pricing products are being offered in all but three member states (Finland, Slovenia, Bulgaria), the majority (144 offerings) of them zero-rating (the rest are application-specific data volume). 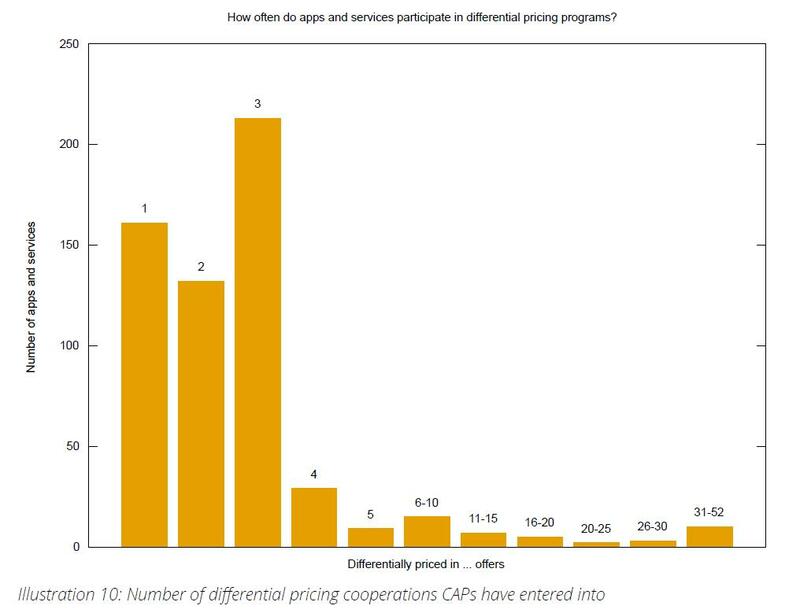 17 countries’ regulators have started formal assessment processes into the differential pricing products offered by the service providers in their countries since the regulation came into effect, while the other 14 have not. 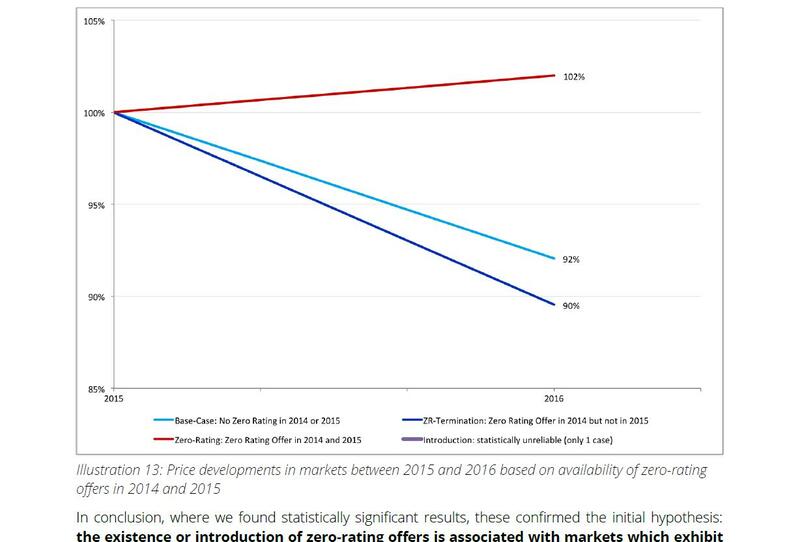 The report went on to analyse the impact of zero-rating offers on the consumer data price, and discovered that over a two-year period, the average data price (€/Gb) in countries with zero-rating offers largely held or slightly rose while the comparable price in those countries without zero-rating products went down by about 10%. The reason for the steady price can be attributed to competition dynamics created by zero-rating, according to the report. Since the large service providers (e.g. Deutcshe Telokom) often have the biggest sway in partnering with content and application providers, the authors reckon, they create a “unique selling proposition” to attract consumers and no longer need to compete on the data package size or prize, which MVNOs and smaller operators can match their offers. This in effect has led to a slow-down in the growth of data package sizes or drop in prices in these markets. It is not only the consumers that have been denied benefits by zero-rating, the authors find, there is also cost on the content and apps providers. In most zero-rating deals, the content and app providers will pay the fee for the traffic to the service providers (according to a report published by the Polish regulator UKE), which will then offer it to consumers at zero-rating. In this case, zero-rated data is actually sponsored data. On top of the fees, in order for the billing to be correctly done, operators would require the content and app providers to make special data transport setup for the partnerships, e.g. change CDN contracts. This will also add operational cost to the content providers. In a high-profile case, when Vimeo did not participate in Deutsche Telekom’s “StreamOn” programme, it stated in an open letter to the German regulator that, although they are a 200 employee strong company, they cannot sustain co-operations with all the service providers whose customers they want to reach with their service through special programmes like this. Two knock-on effects also come out of such partnerships. Due to the demand on fees and increased operational cost, most app and content providers can only afford to enter into limited deals. By the authors’ count, the large majority of app and content providers entered no more than three pricing programmes. On the other hand, more often it would only be the Silicon Valley heavyweights that could afford to tie multiple partnerships with different operators in different markets, they occupy most of the spots on the leader table of differentially priced services being offered. “Among the top 20 zero-rated applications only three are from the EEA,” the report calculated. The findings by the organisation has caught some attention. The Austrian regulator RTR will conduct its own research into the impact of zero-rating on data prices into more recent years and on operator level. The European Commission will also provide an evaluation report of the net neutrality provisions of the regulation by 30 April 2019, three years after the regulation came into effect.